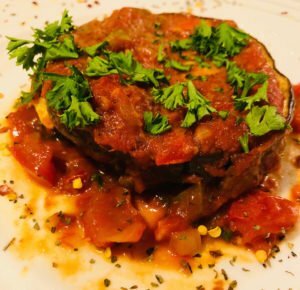 I have never been a huge fan of eggplant, as I usually find it too slimy, but this recipe has converted me. I served my eggplant stacks over a bed of warmed greens but it is great all on its own or would be a fabulous side dish for lots of different meals. Yum! Add in tomato sauce, oregano and parsley and cook for 1 to 2 minutes or until heated through. Over each slice of eggplant, spread a couple tablespoons of tomato sauce and a layer of bocconcini slices.